Indigenous Boats: Too Late to Document Dhows? Too Late to Document Dhows? Baggala. The baggala is the traditional deep-sea dhow of the Persian Gulf and the Gulf of Oman. Its distinguishing features are the five-windowed stern, which is often elaborately carved in the manner of an ancient Portuguese caravel. Baggalas have quarter-galleries, and their curved stems are surmounted by a horned figurehead. Baggalas are built now only at the pot of Sur, in Oman, and are practically extinct in Kuwait. There are probably less than fifty in existence. Bedeni. The common craft of the smaller ports of the Oman and Mahra coasts. Their distinguishing features are their straight lines, their flat, sheerless hulls, their upright masts, and the curious ancient method of steering by means of an intricate system of ropes and beams. The sternpost is carried up very high, and when anchored, or in port, the rudder is usually partly unshipped and secured to either quarter. Bedeni are usually small craft and often have one mast only, though two-masters are common in the trade to East Africa. So while one cannot criticize Villiers for the lack of detail about the vessels he observed or sailed upon, one can still regret there isn't more. It's unfortunate that no one documented these fascinating vessels before so many of them disappeared, in the manner of an Edwin Tappan Adney or a Haddon & Hornell (for American bark canoes, and canoes of Oceania, respectively). Villiers himself regretted that that wasn't his goal, and also that the Arabs were themselves not sufficiently interested in their boats as cultural objects to bother recording them, much less preserving examples for posterity. By the way, Villier's book appears in other editions with a (much) longer subtitle: An Account of Sailing with the Arabs in their Dhows, in the Red Sea, Around the Coasts of Arabia, and to Zanzibar and Tanganyika: Pearling in the Persian Gulf: And the Life of the Shipmasters, The Mariners and Merchants of Kuwait. The photo of a large sambuk is from Villiers' book Sons of Sinbad. 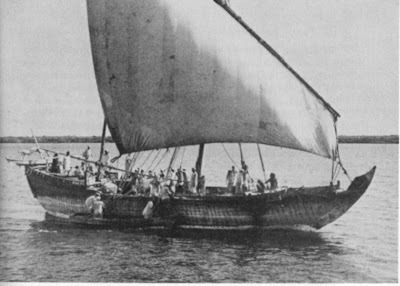 This was a much smaller vessel than the boom on which he sailed from Kuwait to Zanzibar and back again, but was typical of the pearling boats he observed in the Persian Gulf. You might not have seen 'The Sons of Sinbad - the Photographs', photos taken by Alan Villiers at the time of his journeys in 1938-9 and only published by the National Maritime Museum in recent years. Thanks for this, Pat. I haven't actually seen the book, but I'm aware of it and would love to find it somewhere. In fact, the middle of the three Amazon links at the bottom of this post leads to Sons of Sinbad: The Photographs. I have just got a copy of the photos from a branch of the Tihama bookshop in the Heraa Souk in Jeddah on the Madinah expressway near the site of the old cement factory and KAIA airport. It cost sr140 and is an absolute treasure trove of photos. Did a Sabani Show Up at the Olympics?